During the summer of 1970, the 36 of us became the 12th class to attend the Summer Science Program, then located at The Thacher School in Ojai, California, USA. Today the Program is held on two campuses, one at Westmont College in Santa Barbara, California and one on the campus of New Mexico Tech in Socorro, New Mexico. As it did in our day, "SSP" accepts high school students to spend six summer weeks in residence at the Program, studying astronomy, celestial mechanics, space science, higher mathematics, and computer science. Each student calculates the orbital elements of a minor planet from telescopic observations his or her team has made and analyzed. This orbit determination ("OD"), legendary among SSP alumni, occupies much of the program's term. These Web pages serve as a record of our long-ago days and nights at SSP, as a way for us to exchange information with each other, and as encouragement for current high school students to consider applying to the Summer Science Program. 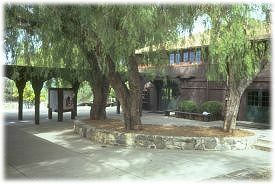 In mid-July 2008, the Summer Science Program hosted the 50th SSP Reunion Celebration in Ojai, celebrating the 50th annual session of the program. Nearly half of us from the Class of 1970 attended. The class roster page lists the members of our 36-member class who wish to be listed here, plus links to their personal Web pages or sites if they wish to include those. The orbiting debris page will serve as a repository (and possible final resting place) of any differentiated, undifferentiated, or disintegrated stuff that's still floating around (in our homes, garages, trash cans, or brains) from the summer of 1970 at SSP.